Susan Greenbaum committed the first sin of musicians: She quit her day job. After working as a corporate executive in Fortune 500 companies, Susan traded her power suits for performing. She has been singing as long as she’s been speaking, growing up in Kansas City, in college at Harvard, and in Boston and Richmond, VA. And now her tax return, under "Occupation," reads, "Singer-songwriter." Susan’s four earlier CDs include three all-original recordings and one holiday collection, “You Are My Holiday.” Billboard has reviewed two songs from “Hey, Hey, Hey!” in the “Singles” column, saying that Susan’s “voice is a delight, strong, clear, and drenched in pleasing harmonies” and calling her “a startlingly adept writer…ripe for national airplay.” Prior to "Hey, Hey, Hey!" Susan released "Wake Up!" as a follow-up to her mostly acoustic debut CD, "Actual Size." Susan has won several national songwriting awards, most recently the Smithsonian Songwriters Award and the Philadelphia Songwriters Project songwriting contest. She was also the Grand Prize overall winner of the Mid-Atlantic Song Contest and also the second-place overall winner in the same contest—the only time in the contest’s three-decade history that the same artist had won multiple overall prizes. Several songs from Susan’s “Wake Up!” CD were finalists in the John Lennon Songwriting Contest and the U.S.A. Songwriting Contest. Susan was voted “Best Singer and Songwriter” in Richmond, VA’s 2011 and 2012 Style Weekly “Best Of” issues and was identified as one of 50 major players on the area’s music scene by Richmond Magazine. Susan won a national competition to be the opening act for recording star Jewel, chosen by industry professionals and over 100,000 online voters. Susan enjoyed overwhelming success on the tour across the Northeast, welcoming thousands of new fans. She and her band were also among select acts picked to perform at a recent Virginia Governor’s Inaugural Concert. Susan draws big, enthusiastic audiences who delight in her lively, diverse and powerful performances. Thanks to the internet, she has fans on every continent. She performs solo and with her band and has appeared at such venues as The Bottom Line in NYC, The Birchmere, Bethlehem Musikfest, Floyd Fest, and Rams Head Tavern. 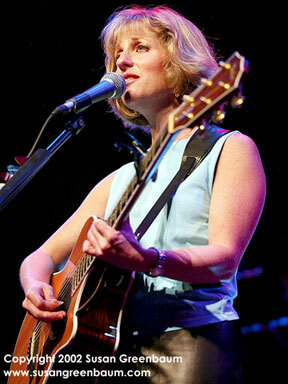 In addition to touring with Jewel, Susan’s credits include performing an acoustic set with Dave Matthews Band violinist Boyd Tinsley; sharing bills with Jill Sobule; and opening for Kenny Loggins, Patty Griffin, Dar Williams, Janis Ian, Todd Snider, Jim Messina, Tuck and Patti, Iris DeMent, Lucy Kaplansky, Lloyd Cole and Catie Curtis. Susan also endorses W.L Gore’s Elixir Strings. The most frequently heard comment at her gigs is, "Great songs--and how does all that big, beautiful sound come out of someone under five feet tall?" Find out at www.susangreenbaum.com.